A 6-issue subscription to The Language Teacher magazine. This including feature articles, teaching tips and lesson plans that work, book reviews, meeting and conference announcements, and job advertisements. 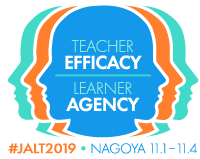 A 2-issue subscription to the JALT Journal, containing practical and theoretical articles, as well as research reports. International Conference, as well as advance conference information. Substantial discounts on local chapter meeting fees. Nearly all local meetings are free to JALT members. See https://jalt.org/main/membership for more details. The faster way is to join online by credit card payment. If this method is not suitable, contact a chapter membership chair to request a membership application and postal money order form. You can bring the postal money order form to any Japanese post office. When and where are the meetings near you? If you live in the Kitakyushu area, you can see Kitakyushu JALT's events calendar. If you live in a different area of Japan, check the National Events Calendar for information on JALT chapters throughout Japan.